Saturday, May 26, 2012. Well, it's Memorial Day weekend - the traditional kickoff of the summer season. And the weather got the memo. Suddenly today the temperature soared to 90. It's probably not been up to 80 before today in this necka-the-woods this year. And the humidity was oppressive - sultry - purely tropical. Dew point was close to 70. I can hike in this kind of weather - did a lot of August AT hiking in Maryland and Virginia the last couple of years. But in August you're used to the heat. Today it snuck up and clobbered me! It was the kind of day when you have to take a break and sit by a cold mountain stream and soak your feet. I let my bottled water soak there too, then had a super-refreshing cool drink. Wish I had brought my filter pump! Had some tough trail to climb today as well (between CT 341 near Kent and the NY-CT state line). Four miles of nearly constant ascending and descending with those exhausting step-ups and step-downs over rock much of the way -- both ways -- that's eight miles. Needless to say I was sweating like a pig. Wait, do pigs actually sweat? Had to check that - the answer is no. OK, I was sweating like a dog ... wait, dogs pant. They don't sweat either. Well ... I was ... I was ... sweating like a ... ... really sweaty human. North of 341 I hiked a short leg to Skiff Mountain Road - much easier trail that way. But not much to see. 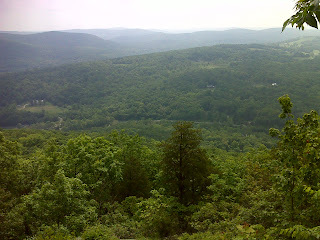 The only photo worth sharing today (above) was the vista from Indian Rocks. Here's a map of today's hike. The title line is a link to more photos and trip information including full GPS data.